Fort Lauderdale-Hollywood International Airport Parking Your car can pay for your parking space. Fort Lauderdale-Hollywood International Airport Parking : The State of Florida hosts some of the biggest and busiest airports in the United States of America. 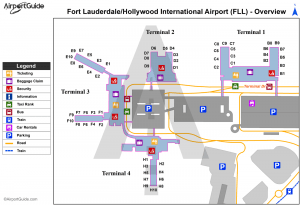 Fort Lauderdale Hollywood International Airport (FLL) in the City of Fort Lauderdale adds up to the list of major airport hubs in the State of Florida. Busy airports like FLL attract a heavy mass of passenger and vehicle traffic checking into the airport. In that regard, parking spaces are often swamped with vehicles. Rushing to grab a parking spot is almost a nightmare. The good news is that TravelCar Rentals and Ride-sharing Facility is now stationed off the airport grounds. We offer cheap airport parking and car rentals to travelers in need of accessing areas surrounding the airport. Access car detailing services, tire servicing, wheel alignment, engine servicing, car wash and car polishing at our parking spaces. You can also charge your electric vehicle at our spots. Our services are accessible to train stations, airports, seaports, and cities near Fort Lauderdale Hollywood International Airport. Fort Lauderdale Hollywood International Airport is built on 1,380 acres of land in the City of Lauderdale, State of Florida. The airport, originally called Merle Fogg Airport, was constructed on the 1st May 1929. It later changed ownership to Broward County and was named Fort Lauderdale-Hollywood International Airport in 1959. The distance from Fort Lauderdale City to Fort Lauderdale-Hollywood International Airport is five kilometers in the South-West direction. FLL is the 3rd most active airport in the U.S based State of Florida and the 19th busiest in the United States of America as of 2017. It is a hub for Spirit Airlines, Tropic Ocean Airways, Silver Airways, and IBC Airways. FLL is a focus city for Norwegian Air Shuttle, JetBlue Airways, Southwest Airlines, and Allegiant Air. FLL is the third largest in passenger enplanements in Florida after Miami International Airport and Orlando International Airport respectively. 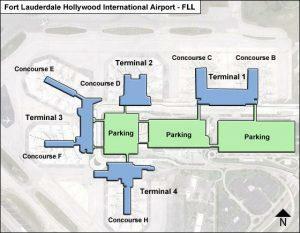 Broward County owns Fort Lauderdale-Hollywood International Airport. The Broward County Aviation Department handles operations at Fort Lauderdale-Hollywood International Airport. FLL offers commercial airline services to travelers in the Miami Metropolitan Area. Flights from FLL reach over 100 destinations in the United States of America. International flights serve The Bahamas, The Caribbean, Mexico, Europe, South America, and Central America. Explore big and small towns near Fort Lauderdale-Hollywood International Airport. The following table highlights significantly large cities and their proximity to FLL. Passenger Traffic 32,511,053 passengers in 2017. FLL has a parking capacity of 12,000 parking spaces. Daily and Hourly parking options are available at Palm Garage and The Hibiscus Garage. Short-term parking at the Cell Phone Waiting Lot is free of charge. The Cell Phone Waiting Lot is at the Arrivals of Terminal 1. Valet parking at the airport is accessible between Terminal 3 and Terminal 4. Valet parking can also be found at the Departure Level of Terminals 1 and 2. Get cheap airport parking deals at TravelCar parking area off the airport grounds. We are a few meters away from the airport’s passenger terminals. We have a free shuttle service for our clients for transportation from our parking lots to the terminals. TravelCar’s parking spaces are gated to provide maximum security for your automobile. The parking lots are covered to minimize the vagaries of nature such as extreme sunshine and hailstorms. We have vigilant guards manning the area 24/7. There is CCTV video surveillance in and around the parking area. Aside from the provision of parking spaces, we also avail car maintenance services. In this case, we have basic car wash, interior vacuuming, interior and exterior car detailing, tire and engine servicing. Book our cheap parking services at downtowns in the following Florida cities around Fort Lauderdale-Hollywood International Airport. FLL has two runways, four passenger terminals, and 63 gates. Terminal 1- Yellow (The New Terminal) Terminal 1 has a total of 23 gates. Concourse A has seven gates from A1-A7. Concourse B has seven gates: B2, B4 and B9. Concourse C contains nine gates from C1-C9. WestJet, United Airlines, Silver Airways, Alaska Airlines, Allegiant Air, Southwest Airlines, and Bahamas Air. Terminal 3 (Purple Terminal/Main Terminal) Concourses E and F have 20 gates in total. Emirates, American Airlines, JetBlue Airways, Norwegian Air Shuttle, Dynamic International and Azul. Terminal 4 (International Terminal/ Green Terminal) Concourse G has 11 gates: G1-G6, G10-G14. Sunwing, Volaris, British Airways, American Eagle, Air Transit, Spirit Airlines, IBC, Avianca, Caribbean, TAME, Copa, Cape Air, and SkyBahamas. As a traveler checking into Fort Lauderdale-Hollywood International Airport, you can only get cheap airport parking at TravelCar’s parking slots. We have the most affordable parking rates offsite. We extend valet services at the terminal curbside. Valet parking services are also cheap compared to other providers. We give discounts on parking prices when a client makes an early booking on our website. Get a car rental from our fleet of rental cars at an affordable rate. You may also list your vehicle for the service if you plan on going away on a trip for a long time. Instead of paying the long-term parking fees, earn some cash from the car rental revenue accrued while you are absent. Nothing brings joy to a busy traveler than parking and luggage assistance right at the airport terminal curbside. Valet parking allows travelers more time to go through the security checkpoint and attend to other urgent activities at the airport. Our valet parking rates are friendly and accessible after online booking on www.travelcar.com. Get customer support from our agents at any time of the day, on all days of the week. You can request for quotes on our website and confirm our location in your respective location in case you need to hire any of our vehicles. We value your feedback on your parking experience. Remember, to get cheap airport parking, TravelCar is the way to go. Our rates are the best you can get in the area. All travelers seek convenience at the airport. We are here to serve you at all times. Your experience at Fort Lauderdale-Hollywood International Airport will be nothing short of glory when you choose TravelCar as a provider of cheap airport parking. North Drive South on Interstate 95, head right to South Federal Highway (U.S 1), drive through Airport Exit to the FLL terminals. Interstate 595 Go through Exit 12A and onto the primary entrance roadway and after that to the airport terminals. South Drive on Interstate 95 Northbound. Head East on Interstate 595. Drive right to South Federal Highway, to the Airport Exit and later to the airport terminals. Perimeter Road North Use State Road 84 and drive towards SW 4th Avenue. Drive South while on SW 4th Avenue to Perimeter Road. Go left and then Eastwards on Perimeter Road. At the main roadway entrance, go right to the Arrivals section of FLL. US-1 Southbound Go right into the primary entrance roadway. Drive to the Airport Arrivals section. Fort Lauderdale Beach Take A1A, drive West on either Las Olas Boulevard or Sunrise Boulevard. Head South on South Federal Highway and after that take the Airport Exit leading to the airport terminals. US-1 Northbound Drive through Griffin Road, head right to the Arrivals section of FLL. Interstate 95, Griffin Road Eastwards Drive East on Griffin Road, head left on US-1, go right to the Arrivals section.